There is over 25,000 known species on earth. 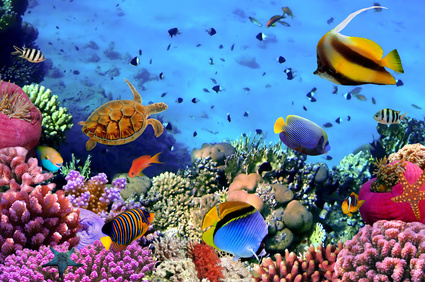 One of the most popular pet in the U.S are tropical fish. Just like mammals fish feel pain and suffer stress. Fish have been on earth for 450 million years. Fish were on earth even before dinosaurs. Fish are classified into three different groups: cartilaginous fishes, bony fishes, and lobe-finned fishes. The first animals to evolve backbones were fish. Fish are cold blooded animals. Goldfish are originally from China, later from Japan. A sharks body are formed of cartilage instead of bones. Fish have a lateral line system which helps detect movement in the water. Some species of fish have skeletons only made up of cartilage. Philippine goby is the smallest fish that is one third of an inch when fully grown. Fish have an organ called lateral line which help them navigate through dark and musky water. The great whale shark is the largest fish which can grow up to fifty feet in length. A goldfish can live up to forty years. Starfish were changed to the name sea stars because starfish are not fish. Goldfish like cold, temperate waters, also they like it calm and peaceful. Sharks have five to fifteen rows of teeth. A giant squids eye can be as big as a basketball. A jelly fish is ninety-five percent water. A majority of fish are counter-shaded. On an average tuna fish can swim a up to forty-three miles an hour. Fish roamed the earth long before dinosaurs did. Starfish can have up to sixteen arms. Unlike most fish sharks do not have scales. When dolphins sleep they keep one eye open. The blue whale is the largest mammal, which weighs fifty pounds at birth and 150 pounds when fully grown. Fish make up more than half the known vertebrate species. All fish have a backbone, that means all fish are vertebrates. Some sharks give birth to live young, others lay eggs. Many fish are fusiform (torpedo-shaped) to help them swim more efficiently through water. Forty percent of fish live in fresh water. When it comes to eating fish, wild caught fish are better than farmed fish. the largest group of fish are ray- finned fishes. By forming wave contractions alone their muscles fish are enabled to swim. Many fish have a dorsal fin which provides stability. Humans are considered threats to sharks. Fish also have ventral fins which helps with steering. Fish have slimy mucus which coats their scales to help protect them. The first species of sharks appeared 420 million years ago. Fish have gills for breathing in the oxygen through the water. A fish’s swim bladder helps them with buoyancy in the water. Sharks range from ten inches to over fifty feet.